The Innovative Fluid Handling (IFH) Group, Rock Falls, IL, has introduced a range of custom storage and dispensing systems and mobile lubrication carts using the company’s new lightweight, economical polyethylene containers. The IFH storage and dispensing system provides an easier, safer and cleaner alternative to 55-gal. drums, while taking up less floor space. It is a superior alternative for handling lubricants and other fluids such as cutting oils, hydraulic fluids and engine oils, according to company officials. Systems using the new polyethylene containers, such as the 68-gal. containers shown in the photo, are ideal for caustic materials that cannot be stored in a traditional steel container, such as herbicides, degreasers, water-based products and water-treatment chemicals. They also are well-suited for economical operation in smaller lube rooms or for fluids that are used infrequently. The systems provide efficient, clean, environmentally friendly product transfer, with no drum tipping, cleaning and switching, and no replacement of drum pumps. Clearly labeled containers and faucets reduce the chance of using the wrong product, while drip pans contain spills. 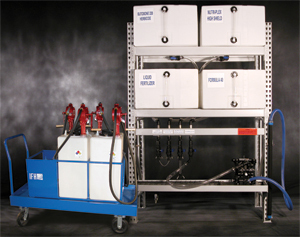 IFH’s new polyethylene containers also are used in a range of custom mobile lubrication carts. Users can specify the number of containers and their capacity as well as a variety of options such as pumps, hoses, nozzles and different sizes of drip-pan cart bases.